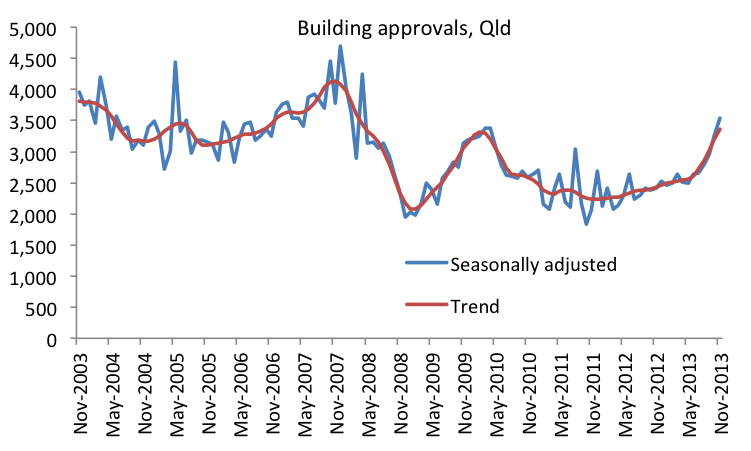 Conditions will certainly improve in the Queensland building industry over 2014 as residential building approvals continue to recover (see first chart below based on the new ABS data), although we shouldn’t get too excited yet because the recovery appears to be driven by the volatile other residential sector, which includes apartments and townhouses (see second chart below). This was also observed by Pete Faulkner in his post from yesterday (Units skew building approvals). 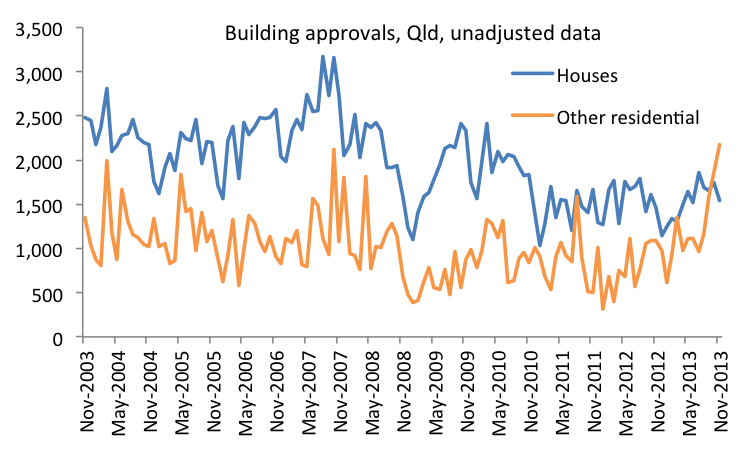 Also, given total approvals are still below pre-financial crisis levels, I think it’s premature to talk of “boom-like approvals,” which is how a UBS economist quoted in Paul Syvret’s article in today’s Courier-Mail describes the approval figures. This entry was posted in Housing and tagged abs, apartments, buildingapprovals, buildingindustry, construction, housing, qld, queensland, townhouses. Bookmark the permalink. Very interesting – the puzzle with this apartment property bubble is – who is buying the apartments. What is driving property developers to increase their stock of apatments for sale. ? > My initial guess is that the apartments will be spruiked to the baby boomers, and their SMSF. According to the ATO just 3.4% of total DIY SMSF are invested in residential property. While this percentage seems low, it represents $17B already. Access to these funds would drive the bubble in low maintenance, income producing, apartment approvals once gearing and compliance with the funds is simplified. Property developers are certainly driving the way for the flexibility to use super funds for property investment. > Perhaps more likely, foreign investment. International investment in the US is drying up, prompting a re-direction of capital. Australia is sought after because of its physical attributes, as well as a welcoming population, and access to visas. Given our only limitation to foreigners owning property is that it be a new development – this will certainly direct Chinese and Asian investment into inner city apartments. > Could it be the baby boomers downsizing, leaving suburban blocks for inner city living. > Perhaps the new generation of Australian workers have attributed value to their commuting time, and are no longer willing to pay high public transport fees, and spend valuable hours in a crowded train. > Perhaps the surge is actually lead by Apartment King and billionaire Harry Triguboff’s advice to look to Queensland for longer-term capital growth. His developments in Brisbane including the The 74 Floor Soleil project (464 apartments) , and the 81 Floor Infinity residential tower (549 apartments) are enough to account for the surge you have observed. Looks like we had all better get used to apartment living………..
Good question about who is buying the apartments. I wonder whether developers have over-estimated likely demand. With all this apartment stock coming up I expect we’ll see some very cheap apartments in the next few years. Your point re. SMSFs is a good one. Thanks. I don’t think the�increased proportion of other residential should be wholly discounted as a fillip for the construction industry as it may also simply represent a continuation of the shift in residential housing away from traditional free-standing houses. Logically you would think so but I don’t think that the up and coming generation who are increasingly locked out of home ownership by high prices should get their hopes up too early. If history is anything to go by, the property and finance sectors will likely find a way to keep prices going up or at the very least, not falling by any significant amount, regardless of the level of actual demand for the real purpose which housing is meant to serve. Their ingenuity at keeping bubbles inflated is admirable. While I generally deplore the situation, I also take the broader view in which I see this as at least providing employment and economic activity as the mining investment boom begins to wind down. As a very important aside, we should note that mining investment may have likely peaked but has not yet begun to significantly decline – it would be premature to declare that the evidence shows that the winding down of the enormous boom is going to be easily weathered. The real decline simply hasn’t begun yet in the bigger picture. Here in Gladstone, the peaking of the local resource investment boom – or at least, the peaking of the construction workforce – has been keenly felt, with local rents tumbling – http://www.sqmresearch.com.au/graph_median_rent_weeks.php?postcode=4680&t=1 – though they remain somewhat elevated compared to history. But when it comes to BUYING, we can see that while prices peaked in 2012, they have not come down by any great amount. http://www.sqmresearch.com.au/graph_median_weeks.php?postcode=4680&t=1 I suspect this is because so much Gladstone property was bought up by investors, who are unwilling to realise a loss despite the fact that it will probably take another boom to get property moving like it was 18 months – 2 years ago (I’m told by those in the local industry that apart from the usual Christmas rush, it’s been very sluggish). So it’s interesting to note that locally at least, we have lots of supply, limited demand…….but prices aren’t really moving to adjust to the situation. Good points. Thanks for the interesting info re Gladstone.